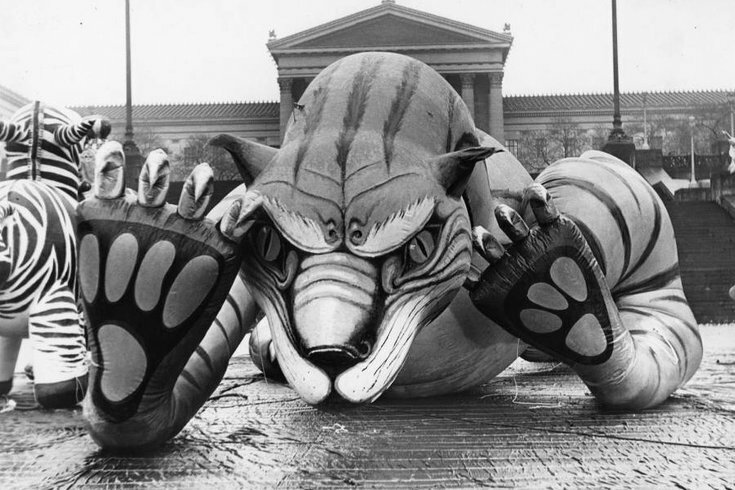 A wildcat balloon float for the 1964 Thanksgiving Day Parade in Philadelphia is seen here in front of the the Philadelphia Museum of Art. Thursday dozens of parade floats and celebrities will crowd Benjamin Franklin Parkway to kick off the holiday season. Though now known officially as the 6ABC Dunkin Donuts Thanksgiving Day Parade, the celebration has seen several iterations – and a few different names – since first introduced in 1920. The event is the oldest Thanksgiving parade in the United States, making Philadelphia the first to ever commemorate the holiday with hovering floats and numerous performances stretching across city blocks. New York didn’t catch on to play copycat until a few years later, in 1924. When the parade first launched, it was known then as the Gimbels Thanksgiving Day Parade, named after its longtime sponsor before the department store shuttered in 1986. Since then, the parade has had several different names, including Boscov's and Ikea, among others, before landing a deal with Dunkin Donuts in 2011. 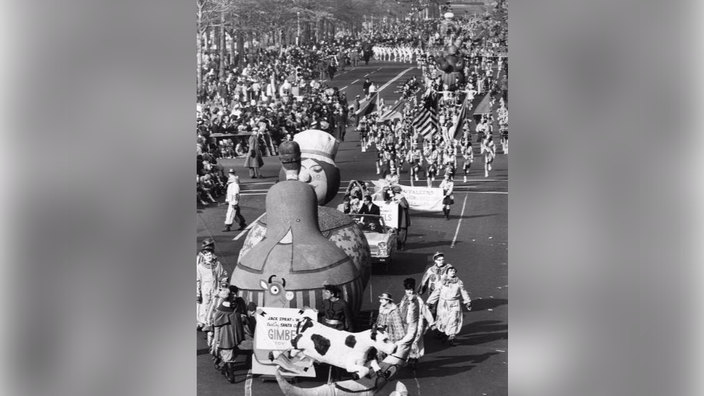 Look through the parade’s long history below, and then make plans to head to the 98th annual Thanksgiving Day Parade yourself. The black and white photos below are from the Temple University Libraries Special Collections Research Center (found here on Facebook, on Twitter, and on Instagram). Crowds packed Market Street to watch the 1961 Thanksgiving Day Parade in Philadelphia. 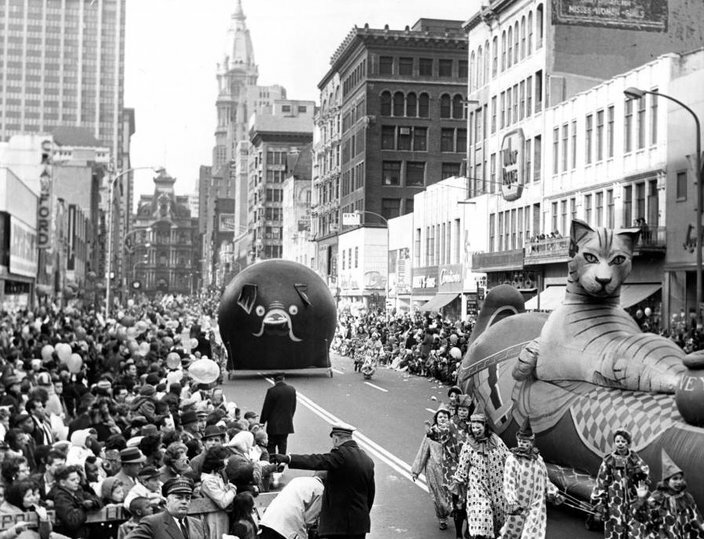 Here balloons depicting “Pussycat” and “Piggy Wig with a Ring” are led toward Gimbels department store, which sponsored the parade for years. 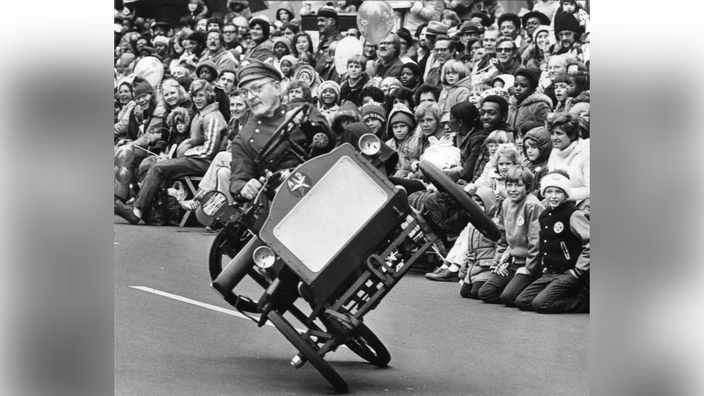 A three-wheeled car entertains the crowd on the Benjamin Franklin Parkway during the 1977 Thanksgiving Day Parade in Philadelphia. 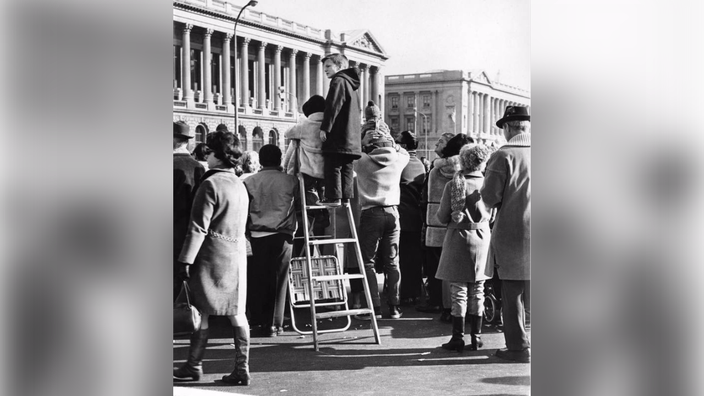 Two children stand on a ladder to get a better view of the 1969 Thanksgiving Day Parade in Philadelphia. 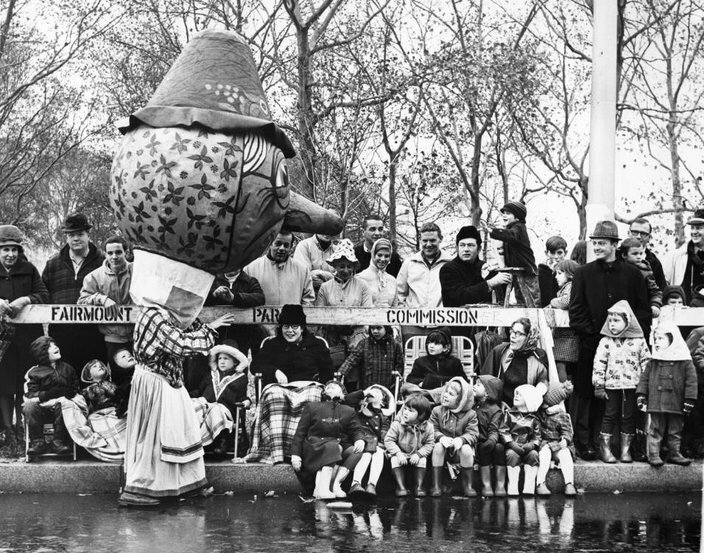 Mother Goose waves to the crowd on the Benjamin Franklin Parkway during the 1968 Thanksgiving Day Parade in Philadelphia. 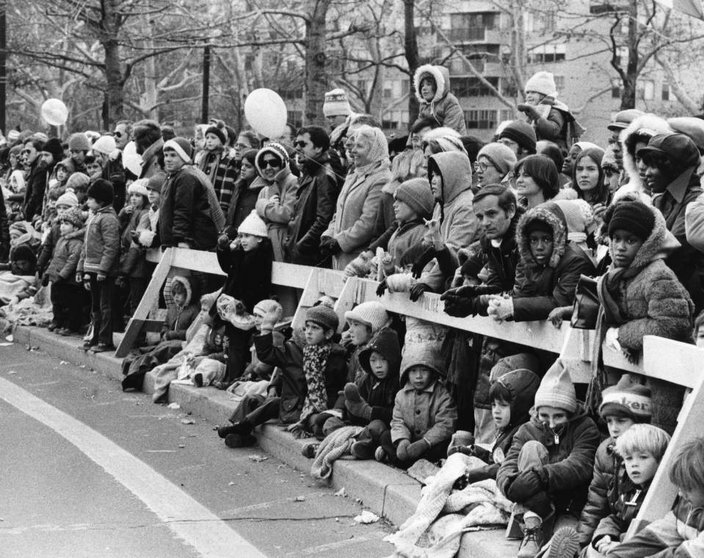 Spectators lined the parade route near 21st Street and the Benjamin Franklin Parkway during the 1976 Thanksgiving Day Parade in Philadelphia. 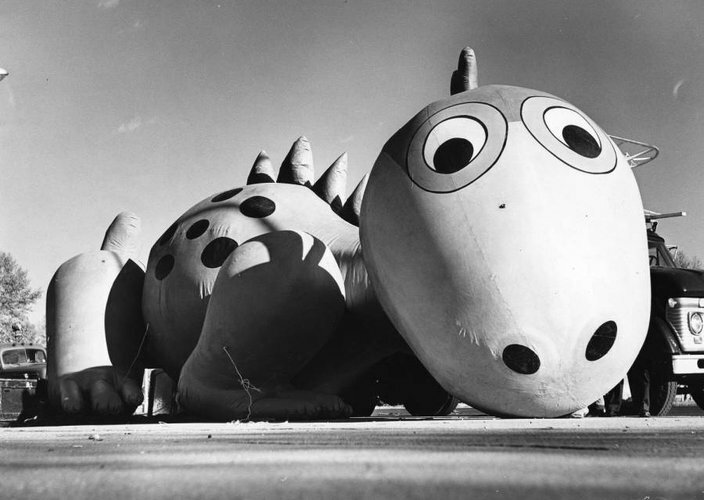 A balloon of Dino from 'The Flintstones' is prepared for the 1965 Thanksgiving Day Parade in Philadelphia. 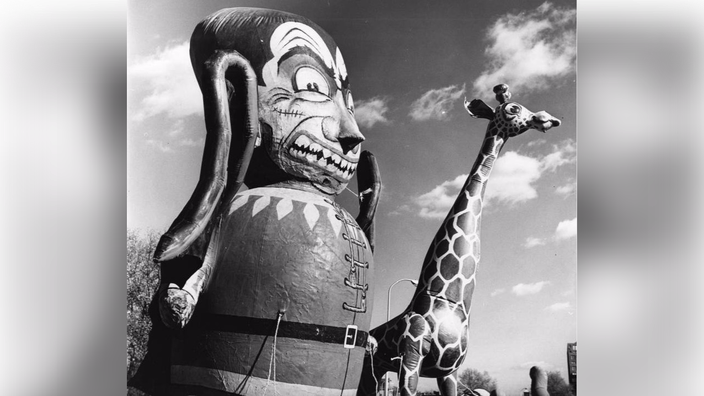 Vampire and giraffe balloons seen here were featured in the 1965 Thanksgiving Day Parade in Philadelphia. Floats, balloons and marching bands move along Benjamin Franklin Parkway during the 46th annual Thanksgiving Day Parade in 1965. 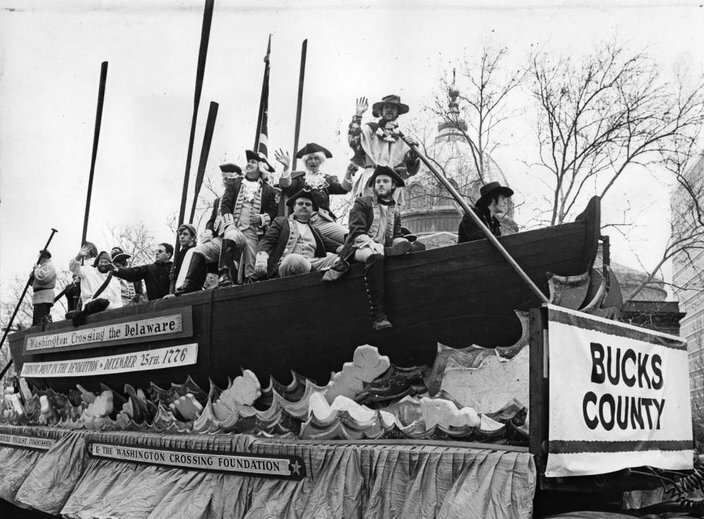 George Washington crossing the Delaware River was a popular theme in the 1977 Thanksgiving Day Parade in Philadelphia. 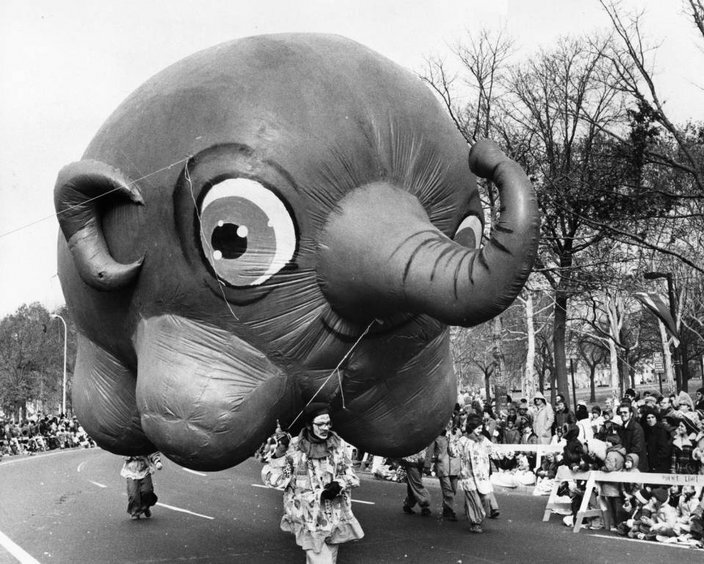 An elephant balloon makes its way along the Benjamin Franklin Parkway during 1976 Thanksgiving Day Parade in Philadelphia. 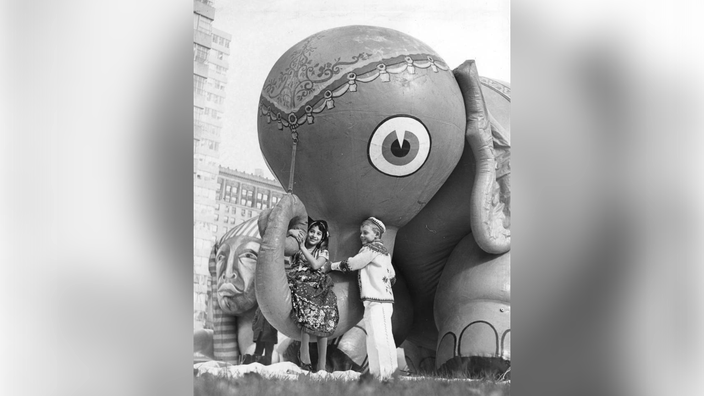 During a preview of the 1962 Thanksgiving Day Parade in Philadelphia, Dolores Genis-Avila, 9, of South Philly, and Anthony Batory, 8, of West Philly, are amused by the elephant balloon. 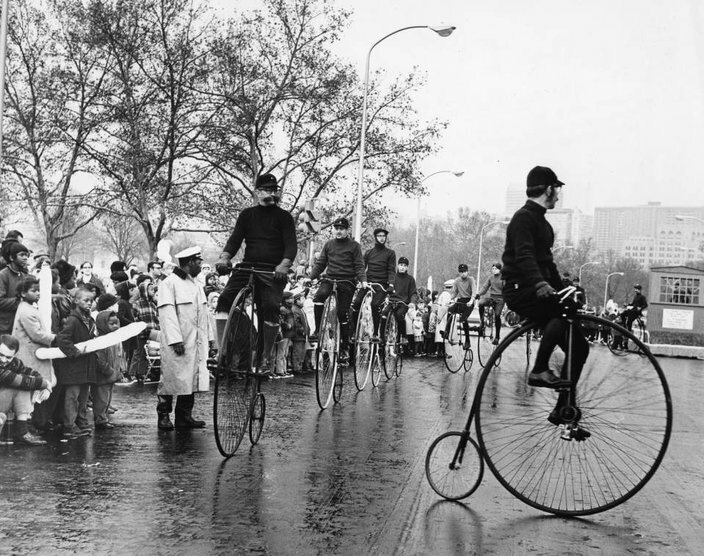 Antique bicycle enthusiasts cruise the Benjamin Franklin Parkway during the 1968 Thanksgiving Day Parade in Philadelphia. 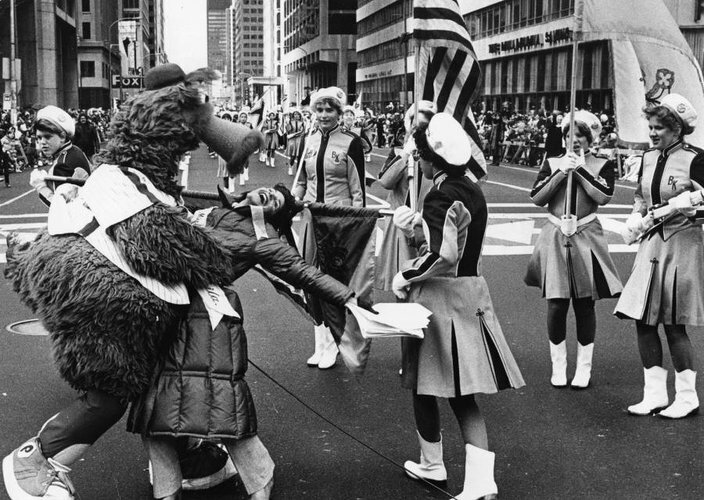 Fresh off his team's World Series victory, the Phillie Phanatic kisses a woman during the 1980 Thanksgiving Day Parade, while members of Bishop Kenrick High School band watch. 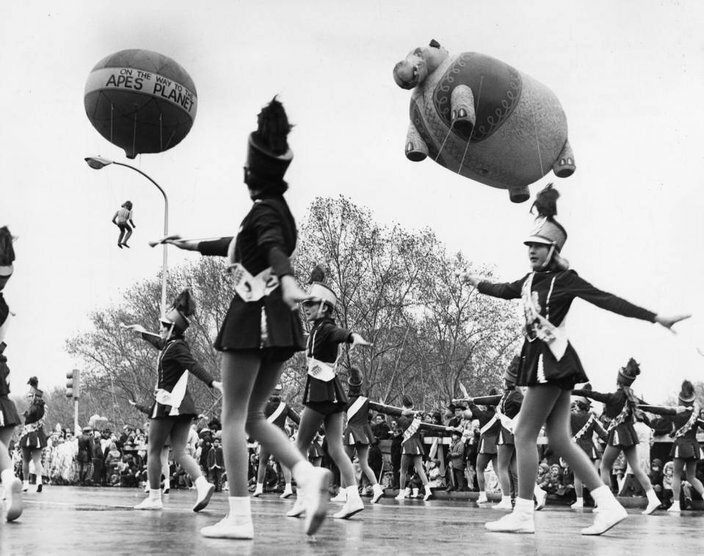 Ape and hippo balloons float above the heads of Linda's Lassies Twirling Corps at the 1968 Thanksgiving Day Parade in Philadelphia. 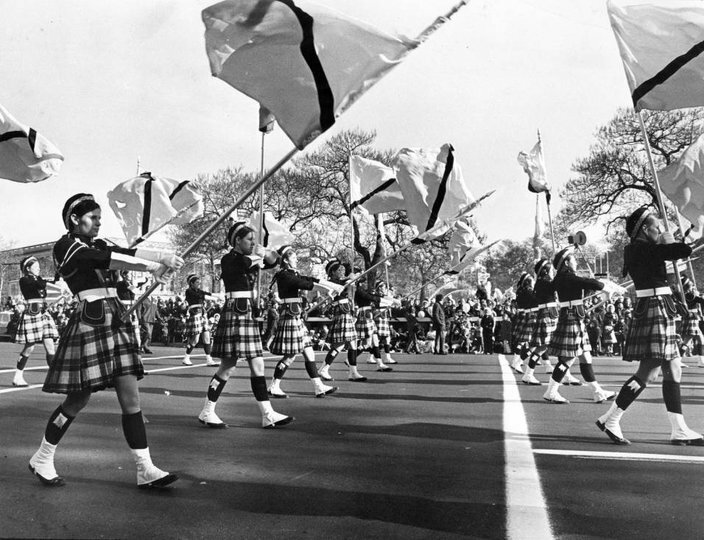 Members of the color guard of Bishop McDevitt High School, in Cheltenham, march along the Benjamin Franklin Parkway at the 1970 Thanksgiving Day Parade in Philadelphia. 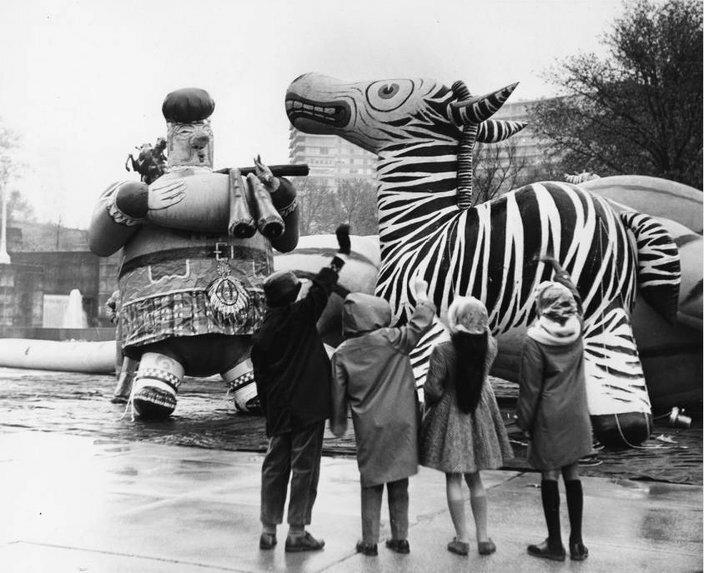 The 1964 Thanksgiving Day Parade in Philadelphia featured balloons of a Scottish bagpiper and zebra. 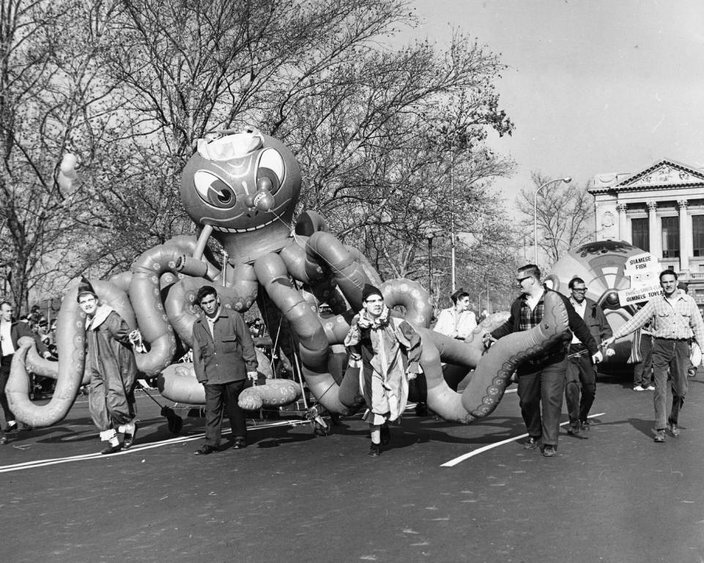 Parade workers guide an octopus balloon around the west side of Logan Circle during the 1963 Thanksgiving Day Parade in Philadelphia. 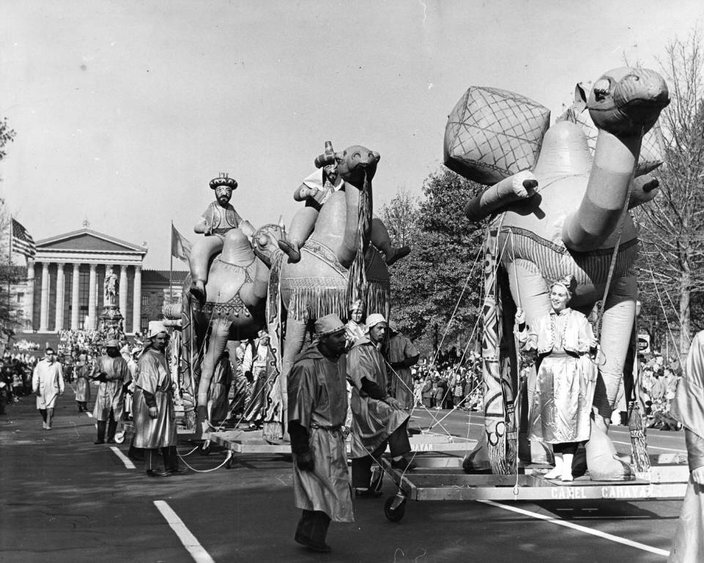 A caravan of camel floats are led up the Benjamin Franklin Parkway during the 1961 Thanksgiving Day Parade in Philadelphia. 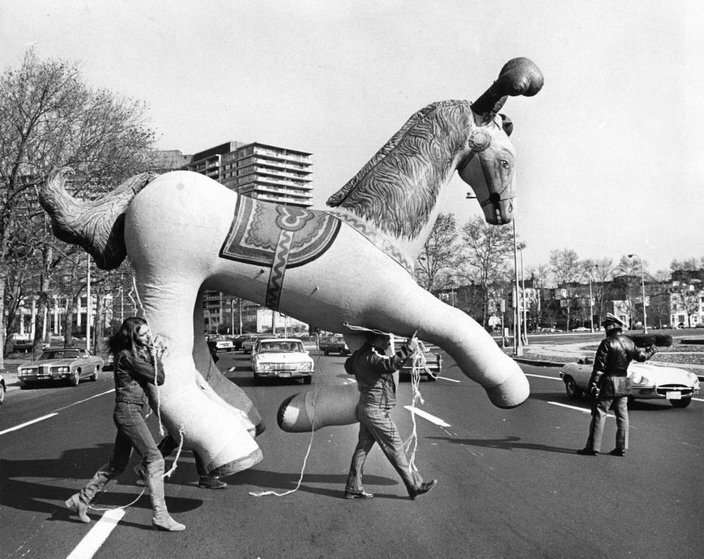 Parade workers carry giant horse balloon across the Benjamin Franklin Parkway in front of the Philadelphia Museum of Art on their way to Thanksgiving Day Parade preview in 1972. 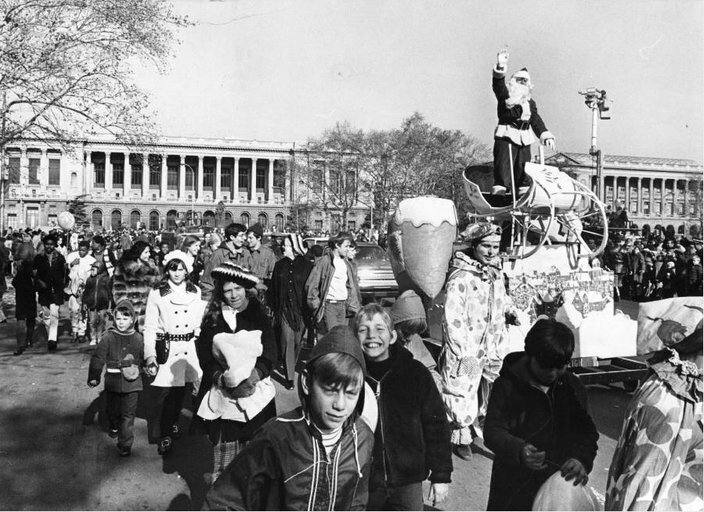 Children smile as Santa Claus waves from his float at the 1970 Thanksgiving Day Parade in Philadelphia. PhillyVoice staffer Jon Tuleya contributed to this article.